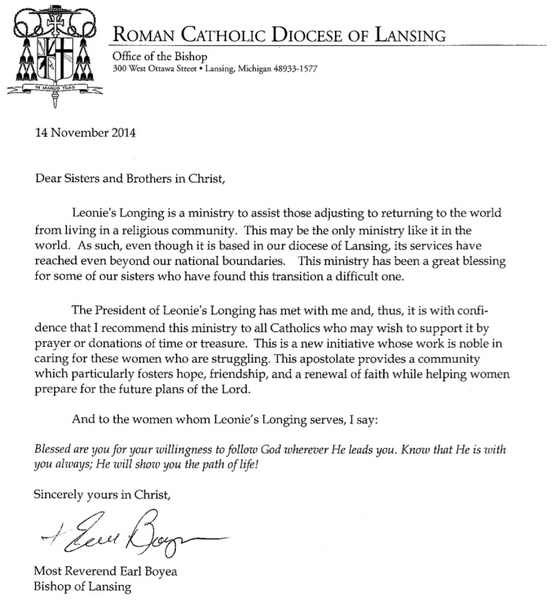 Leonie’s Longing is a nonprofit created to serve the needs of women who have been in the convent or monastery and returned to lay life. We aim to provide community for these women and also create awareness in the Church as a whole, while being faithful to the magisterium. When a woman exits religious life, she typically only has the clothes on her back and a few personal items. Quite often she goes home and stays with family or friends while she discerns her next steps. The first needs are physical – clothes, food, housing, transportation, etc. After these are met, she has emotional and spiritual needs. For example: Can she get a ride to Mass? Can she find a spiritual director? Does she need a good counselor? Returning to lay life is another stage in the journey of a woman’s life. It can be confusing and exciting. The noise of life in the secular world is in sharp contrast to the quiet horarium lived in the convent/monastery. We aim to help women make this transition. It is our goal to connect the laity, dioceses, religious communities and women who have been in the convent. We aim to encourage prayer and support between these groups and in this way foster all vocations. But our ultimate goal is HEAVEN. Who are we? A team of varied individuals which God, in His providence, has brought together. Please pray for women who have left the convent and for the people trying to help them. If you feel called to help in other ways, please visit our Volunteer page and/or contact us! And if you would like to sign up for our newsletter, please do so at http://eepurl.com/yq1rr. If you have experienced religious life, please take our short, 7 question survey by clicking here. We will use the information to help identify your needs. Thank you in advance! Leonie’s Longing wants to help. The most important purpose of this ministry is community for you. It is not “common” to enter the convent, and neither is returning to the world. It may not be a well-worn path, but you are certainly not the first. You should never feel alone. There are many women out there who have experienced this and can empathize with you. The other main goal is to connect you with people and organizations in your area who can help. If you are looking for a counselor, we may have recommendations. If you need clothes, we can help you find them. In general, we seek to help you meet your physical, emotional and spiritual needs through community resources, retreats and networking in new and creative ways. We are always open to suggestions, so if you have an idea, please let us know! Finally, you can help us identify the needs of people who have tried the religious life by taking our incredibly short survey. Leonie’s Longing is run entirely by volunteers and we rely on your generous donations to keep this website online. This apostolate is a portal to resources and content for women who have left religious life and need a starting point to make sense of it all. Please make a donation to help us continue to provide this service! If you would like to explore other methods of giving, please fill out our contact form and we will be in touch with you. Thank you for your generosity, and be assured of our prayers for each of you, our benefactors.